Insulating your pole barn will not only ensure the structure lasts, but will also help regulate the temperature inside while saving you money on monthly energy bills. So whether your pole barn is used as a garage to store your tractor or muscle car, or it’s your workshop and man cave, preventing unwanted air movement into and out of the structure is an important consideration. The most commonly used insulation materials in a pole barn are spray foam, fiberglass, and foam board. With more than 15 years of experience insulating thousands of pole barns across the lower peninsula, RetroFoam of Michigan knows what will work in the structure and what may not be the best fit. As we continue our efforts to educate our customers, we are here to discuss the best insulation materials for your pole barn, including the pros and cons that go along with each material. Foam boards are rigid panels of foam insulation. They are most commonly made with polystyrene, polyisocyanurate, and polyurethane, according to the U.S. Department of Energy. Rigid foam board insulation is a used to insulate the exposed walls of pole barns. This form of insulation is offered in a variety of thicknesses, lengths and facings to better fit the project. Some brands of foam boards have a white foil vapor barrier on each side that works to keep water from traveling into the walls of the pole barn and keeps any mold from deteriorating the structure. Rigid foam board insulation products are made to be water resistant. This will help limit moisture buildup and mildew growth in the pole barn. Expanded polystyrene board, which is made using a mould to contain small beads, is the only material type that doesn’t use HCFCs in its production. This makes it a greener choice for pole barn insulation. The expanded polystyrene board is the cheapest foam board material on the market. Extruded polystyrene foam board, which is made when liquid formed is continuously expelled through a die which expands during the cooling process, is reasonably priced and easy to install in pole barns. Expanded polystyrene foam boards are produced using closed cell foam, making them ideal for exposed walls of pole barns. The installation of foam boards can be a DIY project to the experienced handyman. The joints between sheets and boards must be taped or caulked to prevent air flow into the pole barn. The foam board sheets must be custom cut to fit the pole barn areas to be insulated. Expanded polystyrene boards have air bubbles that can stop heat transfer, but can collect moisture making it ineffective for preventing mold and mildew-growth. Polysio foam boards can decrease insulating abilities over time. Rigid foam boards are slightly more expensive than traditional insulation materials used in the pole barn. Fiberglass is a traditional form of insulation material used in homes and in pole barns because it is lightweight, inexpensive, and can be installed as a DIY project by the experienced handyman. Fiberglass insulation is inexpensive for pole barns compared to other materials. Fiberglass can be a DIY project for experience handyman homeowners to install in the pole barn. Fiberglass insulation can slow the transfer of hot and cold air by trapping it in the material. Fiberglass does little to reinforce the structure of the pole barn, according to The Pole Barn Company. The material does not stop moisture from getting into the pole barn, thus promoting the growth of mold and mildew. Because fiberglass can slow the transfer of cold and hot air, it is still air permeable which means is does nothing to prevent warm, humid interior air from making contact with the pole barn walls. Fiberglass insulation will need to be replaced every 25 years if it is dry, and much sooner if it gets wet. When fiberglass in the pole barn is disturbed in any way it can release particulates into the air that can be inhaled causing coughing, nosebleeds, and other respiratory issues. When fiberglass comes in contact with the skin, small particulates can lodge in the pores causing rashes, irritation, and itching. If the fiberglass in the pole barn must be disturbed, people in the area should wear protective goggles, long-sleeved shirts, pants, and gloves. Closed cell spray foam insulation is used in pole barns when the walls are exposed. This is because it is a much more durable material, so if it is run into with a forklift or hit with tools, it’s not going to get damaged. Closed cell spray foam insulation is a much more durable insulation material used in the exposed walls of pole barns. Spray foam creates an air seal that can help to make the pole barn weather conditioned while having the ability to regulate the temperature and humidity levels. Closed cell also doesn’t retain water, so there would be no mold or mildew growth. Spray foam is a great option for the pole barn ceiling as well as it provides a complete air seal of the structure. Insulating the pole barn with spray foam can help reduce monthly energy bills to heat and cool the structure. Spray foam insulation isn’t a food source for pests. The insulation material is class one fire rated, which makes it safe to use in pole barns. Spray foam insulation is a more expensive material compared to other forms of insulation used in the pole barn. An experienced contractor would have to install the spray foam insulation in the pole barn, as it is too complex for a DIY project. Certain brands of spray foam have a slight odor when installed. It is important to know which brand is being installed in the pole barn. 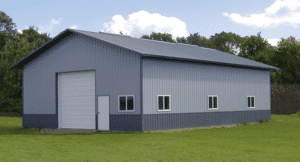 The Pole Barn Company said the longevity of spray foam insulation and the material’s effectiveness as a solid barrier from outside air makes it a prime choice for pole barn insulation. If you agree that spray foam insulation is the better fit for your pole barn and live in Michigan’s lower peninsula, give us a call at 866-900-3626 for a free estimate, or fill out the form on our website.